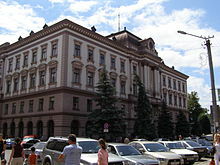 Ivano Frankivsk National Medical University is the oldest one university in Ukraine. It was established in 1945 and now more than 1000 foreign students from different countries are study at the university. Ivano Frankivsk National Medical University own the license from the Ministry of Education,Ukraine to enroll the international students as the medium of instructions is English. Degrees awarded by the medical university is very well known all over the world because of its highly professional way of teaching and recognition by WHO. Ivano Frankivsk National Medical University is even listed in the International Education Medical Directory(IEMD). Even one may find the Ivano Frankivsk National Medical University in the WHO directory. Once you have a degree from Ivano Frankivsk National Medical University,You may sit for any licensing exams like USMLE,PLAB,SCHS,PMDC,MCI,HPCSA etc etc. For the all duration of study the medium of instructions is English at the university and the following faculties are available. Interested applicants may contact us directly for the admission process by phone,email or whatsupp and viber.